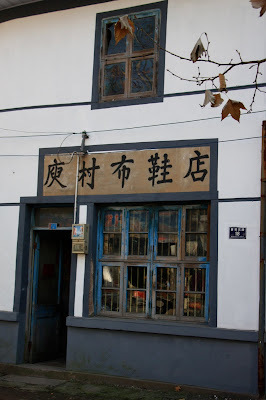 At the base of Moganshan mountain is a small village where my attention was drawn to a tiny shop, an old gentleman visible through the window working a treadle sewing machine. He was making shoes by hand. 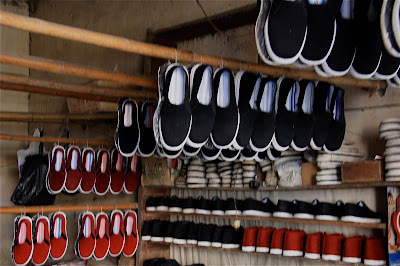 Only two kinds - canvas, for summer, in black, and corduroy for winter, in black, or red. The plain black shoes had jazzy blue-striped innersoles, and were the only concession to decoration. I bought a canvas pair, and I bet they last longer than my Converse sneakers.